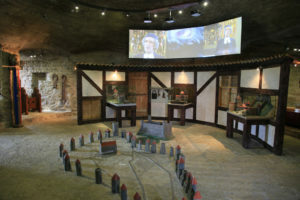 The permanent exhibition in the Kiek in de Kök tower is aimed to give the visitor an overview about the birth of the town, the history of its fortifications and main military campaigns and sieges from the 13th to the 18th century. The scheme of the setup of the permanent exhibition is available on the tempered glass information board right next to the entrance to the tower part of the museum, where a visitor a greeted by two armour suits in glass display boxes. The ground floor and the first floor of the tower, historically used respectively as the storage space and the lower defence floor, are nowadays used mainly for temporary exhibitions, special events, and concerts. Visitors start from the first floor and it is up to them, whether they wish to descend down to the ground floor to see a temporary exhibition on display over there or just to see the layout of that room. Heading up from the first floor to the second, a visitor can opt whether to use the modern staircase or the original winding stone staircase for more authentic experience. The original stone staircase passes by an ancient privy facility called ‘dansker’, while the modern staircase landing has an access to the wall-walk leading to the adjacent Neitsitorn tower. The wall-walk with a picturesque view to the Old Town is open during the summer season and accessible for visitors who have also purchased a ticket to the Neitsitorn tower. The second floor is where the permanent exhibition starts. Historians believe that the predecessor of the stronghold on Toompea Hill, was the Iru hill fort, abandoned around the turn of the 10th and 11th centuries. The model of the Iru fort is right in the beginning of the exhibition on the second floor. During the time, the Iru hill fort was abandoned, a stronghold was built on the limestone rise of Toompea and a settlement likely appeared at its foot. The archaeological finds from the Late Iron Age give a glimpse of the early days of the city. Laminated information sheets providing additional details about the display are available in a box next to the entrance to the floor and can be perused by visitors. Other items on display on the second floor inform the visitor of medieval defences, walls, towers, and gates. The layout of the Reval city defensive wall and models of all of its towers sprawling across the middle of the floor can be interacted with. A visitor can carefully pick up individual towers and check their names written at the bottom, while consulting the respective map on the wall. Next to the model showing the placement of towers, visitor can find glass display cases with models of medieval city gates of Reval. 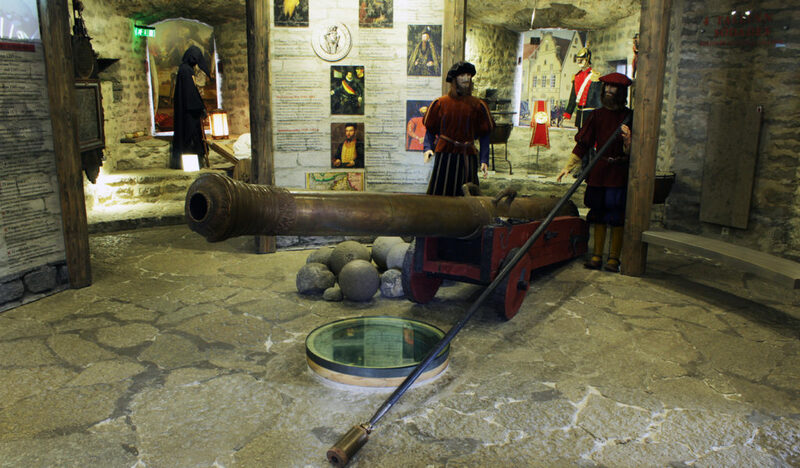 Other items on display tell the visitor the story of crime and punishment in the medieval town, allowing a close look at several torture and public humiliation devices as well as to an executioner’s sword. The gun in the embrasure is couple of centuries old and equipped with reconstructed fittings for shooting. Being seated on the wooden benches, a visitor is welcome to rest their legs, while watching a film about the history of the city. The film is available in Estonian, Russian, and English, and if it is already not on, our employee is more than happy to show it to you in your preferred language upon request. The third floor display is dedicated to the past sieges of and battles for Reval (Tallinn). 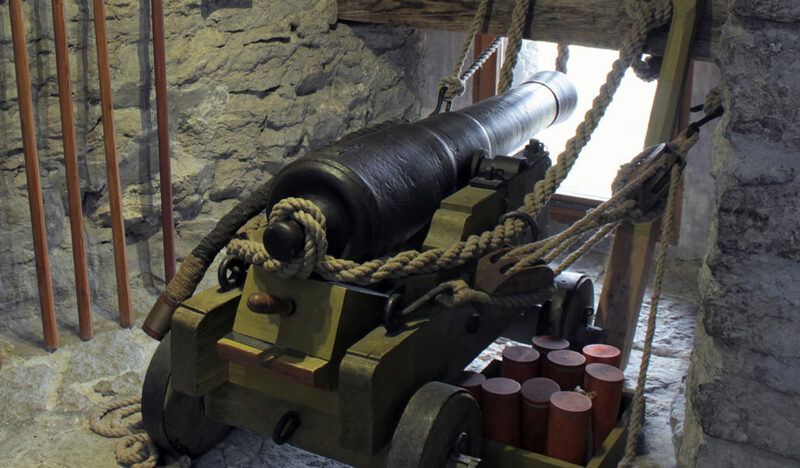 A visitor can take a close look at three big weapons: two cannons from 1559 and 1560 named respectively the Lion and the Bitter Death, and a breach loading gun from early 15th century. All these artillery guns are exact replicas as the originals were taken to St. Peterburg in 19th century and never returned. The original cannons were made by local masters, the Lion by Karsten Middeldorp in 1559, and the Bitter Death by Kort Hartmann in 1560. Reval weapon masters were famed and praised, and so the muzzle loading guns are a perfect example of the exquisite skill and taste of the local masters. The Lion bears an image of a lion and both coats of arms of Reval help up by gryphons. Beneath the coats of arms a verse has been inscribed relating: ‘The Reval Town Council nam’d me The Lion / to destroyeth all enemies dishonouring peace/ in the year 1559 Karsten Middeldorp didst cast me/ and this is the whole sooth’. The glass display cases showcase armour of the fighting sides. The coat of arms of rulers of the period remind us of the battles and sieges taking place during the Livonian War, taking place from 1558 to 1583, when armies of various kingdoms – Denmark, Norway, Sweden, Poland, Lithuania, and Russia – were fighting over the territory of Old Livonia (present day Estonia and Latvia). Before or after the visit, a visitor can look up to take a look at the south side of the tower from outside and see the stone cannon balls walled in. These are the authentic cannon balls shot at the Kiek in de Kök battery tower from the cannons belonging to the troops of the Russian Tzar Ivan the Terrible during the siege in January-March 1577; as the gaping holes in the side of the tower were repaired after the siege, the cannon balls were walled in as a reminder. Back in the 16th and 17th cc, the frontrunners of the city defence were the members of the prominent Brotherhood of Black Heads (Bruderschaft der Schwarzhäupter), a military organisation back then with a motto ‘Aut vincendum aut moriendum’ (to conquer or to die), and so a visitor can learn about their role in the city defence. 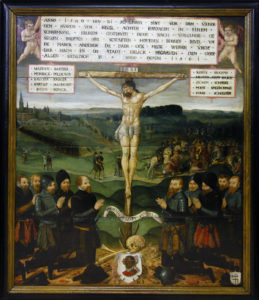 The famous painted epitaph made by Lambert Glandorf in 1561 commemorates the Black Head brothers who were killed defending Reval against Russian troops (so-called Moscovites back then) on 11th September 1560 in the Battle of the Jerusalem Hill. 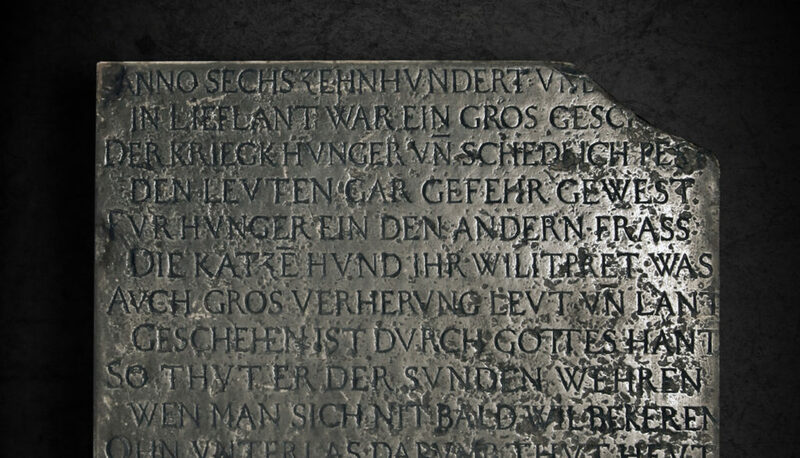 The epitaph gives a fascinating glimpse to the city skyline and layout back in the 16th century. 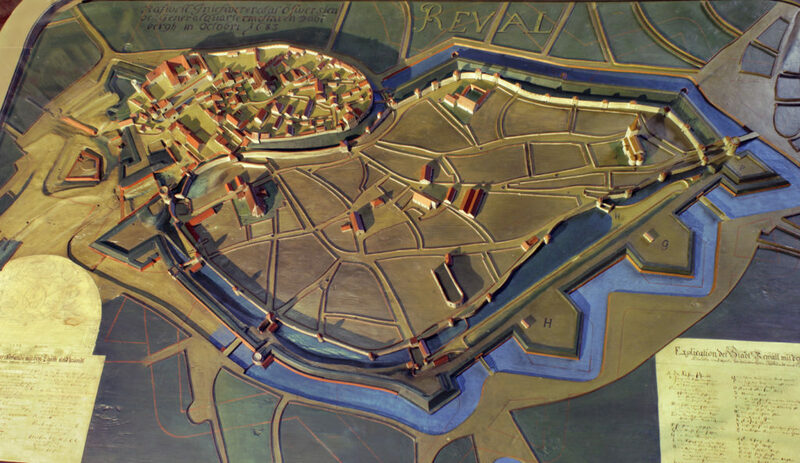 On display is a replica model of the new earthwork fortifications of the city from the 17th century. The original model is located in the Swedish Army Museum in Stockholm, Sweden. Part of the exhibition reminds us that in addition to battles and sieges, famine and plagues were also frequent visitors and had its impact on the history of the city. The year one thousand and six hundr’d two / ov’r h’re in Livonia ev’ryone shall rememb’r / f’r many of us our earthly journey cameth to an endeth / at which hour the war, famine and foul pestilence wast running riot. / A sir wast eating his broth’r because of famine / and wast consuming cats and dogs. Read, traveller, from this stone, what wicked fate / has stricken us two years past 600. / When the century ended, thousands were dying / over again, upon whom the famine had befallen. The same embrasure where the plague epitaph has been mounted, is also displaying a grim Plague Doctor in his protective suit and distinctive plague mask. Attached to the walls, visitor can find long lists of wars and battles fought over this land as well as a corner dedicated to the naval battles and types of warships used in the 1790 naval battle between Sweden and Russia. Like the previous floor, this floor has a box next to the entrance with laminated information leaflets that can be perused, benches where visitor can rest their legs and just reflect or watch the films. This floor has two films of the history of sieges and wars involving Reval (Tallinn), the second of which is focusing on 20th century. The films are available in Estonian, Russian, and English, and again, if films are not playing already, our employee is more than happy to show these to you in your preferred language upon request. You can always ask them to restart the film in a language most suited for you, providing there are no other visitors already watching. The modern stairs end at the third floor. In order to continue to the fourth floor, the visitor has to ascend the winding stone staircase that can be accessed from the floor or the landing on the top of the modern staircase. There is a small kitchen hidden between the two staircases, displaying what the kitchens looked like centuries ago, and especially children tend to be enthusiastic about the roast suckling pig on the fire pit. The fourth floor of the tower has been divided internally into two floors or levels and has a uniform theme — it is a dedicated Armoury Chamber where the arms and some armament from the collection of the Tallinn City Museum is showcased in glass display boxes. There are armour and swords and shootings guns that were used before the advent of the firearms, back in 13 and 14 century. Multiple firearms from the 15th to the 20th century form a major part of the display. The fifth floor is the top floor of the tower and is used for temporary exhibitions and special events. As there are seats available, it gives a chance for a visitor to rest the legs. 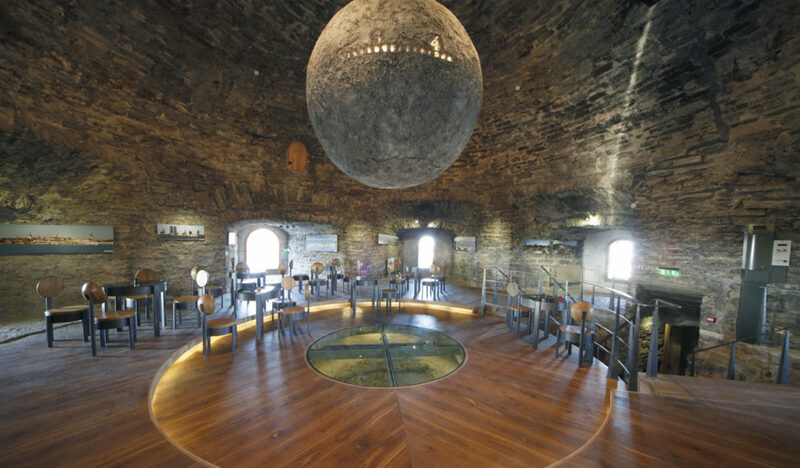 The ceiling holds a massive clock, shaped like an oversized cannon ball. Perhaps the biggest permanent attraction of the floor is the magnificent, postcard-like view opening through the embrasures to all directions. There is also a toilet on that floor. So the top floor gives a visitor a chance to see the temporary exhibition, admire or take photos of the views, and recuperate a bit before starting to descend the narrow winding stone staircase. We no longer have a café on that floor. The nearest café-restaurant is in the adjacent Neitsitorn tower.